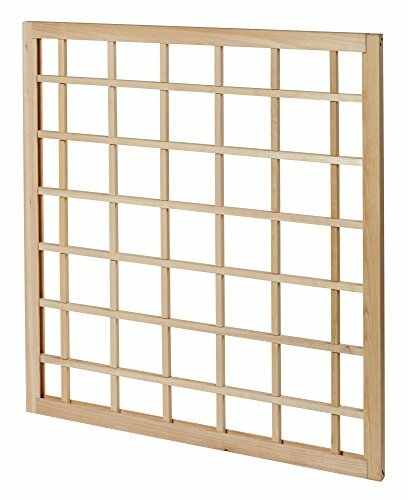 Naturalyards Wall Mount Trellis are available in multiple sizes, from 2 to 4 feet wide and 3 to 6 feet tall. The interlocking crosspieces form a strong trellis grid, to support heavy climbing vegetables, such as cucumbers, beans and squash, as well as flowering vines, such as clematis, honeysuckle, and wisteria. Easy assembly; includes screws and spacer blocks for mounting on walls or fences, or attaching to in-ground posts (not included). Made from durable cedar wood, protected by a non-toxic sealant that is safe for vegetable gardens; the trellis can be painted or stained, or left unfinished to gray naturally. 30-Day Satisfaction Guarantee and 10-Year Limited Warranty. Made in the USA. Assembled dimensions: 1.5" D x 44.9" W x 48" H.